Pepsi is a carbonated cola soft drink, that copied Coca-Cola after 12 years of its existence. The drink is made by PepsiCo. A can of Pepsi (330ml) has 8 cubes of sugar in it, whereas Coca-Cola has 7. They often sponsor (help fund/advertise on an event) sports events and music events, like the Super Bowl. Pepsi also has huge sponsorships for the MGM Mirage hotels in Las Vegas, Nevada. They only serve Pepsi products at the hotels. Pepsi comes in many different flavors, and forms. A few of the different Pepsi types include Diet Pepsi, Pepsi Max, Pepsi ONE, Pepsi Wild Cherry, etc. It was first introduced as "Brad's Drink" in New Bern, North Carolina in 1898 by Caleb Bradham, who made it at his pharmacy where the drink was sold. It was later named Pepsi Cola, possibly due to the digestive enzyme pepsin and kola nuts used in the recipe. Bradham sought to create a fountain drink that was delicious and would aid in digestion and boost energy. In 1903, Bradham moved the bottling of Pepsi-Cola from his drugstore to a rented warehouse. That year, Bradham sold 7,968 gallons of syrup. The next year, Pepsi was sold in six-ounce bottles, and sales increased to 19,848 gallons. In 1909, automobile race pioneer Barney Oldfield was the first celebrity to endorse Pepsi-Cola, describing it as "A bully drink...refreshing, invigorating, a fine bracer before a race". During the Great Depression, Pepsi gained popularity following the introduction in 1936 of a 12-ounce bottle. Initially priced at 10 cents, sales were slow, but when the price was slashed to five cents, sales increased substantially. With a radio advertising campaign featuring the jingle "Pepsi-Cola hits the spot / Twelve full ounces, that's a lot / Twice as much for a nickel, too / Pepsi-Cola is the drink for you," arranged in such a way that the jingle never ends. Pepsi encouraged price-watching consumers to switch, obliquely referring to the Coca-Cola standard of six ounces per bottle for the price of five cents (a nickel), instead of the 12 ounces Pepsi sold at the same price. 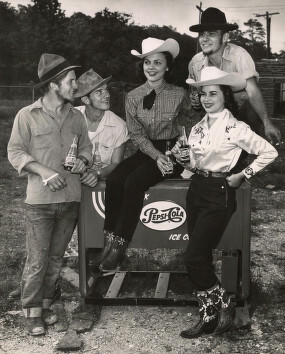 Coming at a time of economic crisis, the campaign succeeded in boosting Pepsi's status. In 1937 500,000,000 bottles of Pepsi were consumed. 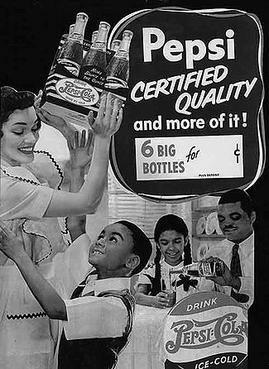 From 1936 to 1938, Pepsi-Cola's profits doubled. Pepsi's success under Guth came while the Loft Candy business was faltering. Since he had initially used Loft's finances and facilities to establish the new Pepsi success, the near-bankrupt Loft Company sued Guth for possession of the Pepsi-Cola company. A long legal battle, Guth v. Loft, then ensued, with the case reaching the Delaware Supreme Court and ultimately ending in a loss for Guth. In 1975, Pepsi introduced the Pepsi Challenge marketing campaign where PepsiCo set up a blind tasting between Pepsi-Cola and rival Coca-Cola. During these blind taste tests the majority of participants picked Pepsi as the better tasting of the two soft drinks. PepsiCo took great advantage of the campaign with television commercials reporting the results to the public. In 1976 Pepsi, RKO Bottlers in Toledo, Ohio hired the first female Pepsi salesperson, Denise Muck, to coincide with the United States bicentennial celebration. In 1996, PepsiCo launched the highly successful Pepsi Stuff marketing strategy. By 2002, the strategy was cited by Promo Magazine as one of 16 "Ageless Wonders" that "helped redefine promotion marketing." In 2007, PepsiCo redesigned their cans for the fourteenth time, and for the first time, included more than thirty different backgrounds on each can, introducing a new background every three weeks. One of their background designs includes a string of repetitive numbers 73774. This is a numerical expression from a telephone keypad of the word "Pepsi." In late 2008, Pepsi overhauled their entire brand, simultaneously introducing a new logo and a minimalist label design. The redesign was comparable to Coca-Cola's earlier simplification of there can and bottle designs. Also in 4th quarter of 2008 Pepsi teamed up with Google/Youtube to produce the first daily entertainment show on Youtube, Poptub. This daily show deals with pop culture, internet viral videos, and celebrity gossip. Poptub is updated daily from Pepsi. Since 2007, Pepsi, Lay's, and Gatorade have had a "Bring Home the Cup," contest for Canada's biggest hockey fans. Hockey fans were asked to submit content (videos, pictures or essays) for a chance at winning a party in their hometown with the Stanley Cup and Mark Messier. In 2009, "Bring Home the Cup," changed to "Team Up and Bring Home the Cup." The new installment of the campaign asks for team involvement and an advocate to submit content on behalf of their team for the chance to have the Stanley Cup delivered to the team's hometown by Mark Messier. Pepsi has official sponsorship deals with three of the four major North American professional sports leagues: the National Football League, National Hockey League and Major League Baseball. Pepsi also sponsors Major League Soccer. Pepsi also has sponsorship deals in international cricket teams. The Pakistan cricket team is just one of the teams that the brand sponsors. The team wears the Pepsi logo on the front of their test and ODI test match clothing. On July 6, 2009, Pepsi announced it would make a $1 billion investment in Russia over three years, bringing the total Pepsi investment in the country to $4 billion. In July 2009, Pepsi started marketing itself as Pecsi in Argentina in response to its name being mispronounced by 25% of the population and as a way to connect more with all of the population. In October 2008, Pepsi announced that it would be redesigning its logo and re-branding many of its products by early 2009. In 2009, Pepsi, Diet Pepsi and Pepsi Max began using all lower-case fonts for name brands, and Diet Pepsi Max was re-branded as Pepsi Max. The brand's blue and red globe trademark became a series of "smiles," with the central white band arcing at different angles depending on the product. Pepsi released this logo in U.S. in late 2008, and later it was released in 2009 in Canada, Brazil, Bolivia, Guatemala, Nicaragua, Honduras, El Salvador, Colombia, Argentina, Puerto Rico, Costa Rica, Panama, Chile and Australia; in the rest of the world the new logo was released in 2010. The Pepsi logo used from 2003 to late 2008. Pepsi Wild Cherry continued to use this design through March 2010. Pepsi ONE continued to use this design until mid-2012. This logo is still in use in some international markets. The original version had the Pepsi wording on the top left of the Pepsi Globe. In 2007, the Pepsi wording was moved to the bottom of the globe. Pepsi Facts for Kids. Kiddle Encyclopedia.